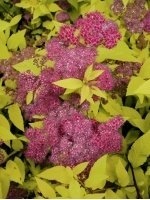 A wonderful Shade loving plant with unique blue-green foliage, that will hold its strong leaf colour all season. In Spring it is topped with tall stems of bell shaped, pale lilac- cream flowers, Great for attracting birds to your garden. It grows fairly slowly and is ideal for either a ground cover or specimen, growing from 30 – 120cm wide around. Its textured, blue-green leaves are thick enough to be snail & slug resistant, although it is a good idea to protect from them. Frost Hardy, Prefers a full deep shade to part shade position and becomes Dormant in winter.